To see the date for each picture, scroll over the image. Click on an image to enlarge it and scroll through the photos using the < and > arrows, and the x to return to the article. His nibs. Making up less than a quarter of the red vineyards in Bordeaux yet the major component of many of its greatest wines, like Latour, Lafite, Mouton and Château Margaux. 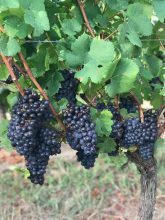 Cabernet Sauvignon is the main variety on the Left Bank in appellations like Pauillac and St-Julien, with Merlot in a supporting role. Bordeaux is often thought of as a blend of Merlot and Cabernet Sauvignon, though you’re more likely to find successful 50/50 blends from Pessac-Léognan, the Graves, Margaux, St–Estèphe and the Haut-Médoc than elsewhere. 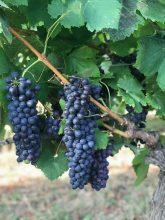 Cabernet is a late ripener and usually a degree or so lower in alcohol than Merlot given the same soil and conditions, which is quite handy in hot years like 2018. Not far behind Merlot in the véraison this year, though that would differ on other terroirs. Making up just 9% of all red vineyards in Bordeaux yet a serious player for many leading estates in St-Emilion especially, such as Ausone, Cheval Blanc and Angelus. 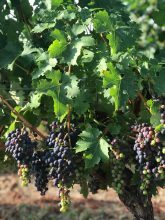 A later ripener than Merlot for sure, véraison came late this year for our Cabernet Franc, towards the end of August. An increasingly popular Bordeaux variety, in a small way, notably in the Haut-Médoc, and as much as 10% of the blend in some leading estates like Pichon Lalande in Pauillac, depending on the vintage. 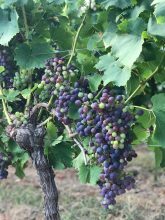 A late ripener and a later véraison this year in the second half of August. Probably my favourite leaf shape of all the red varieties, though admittedly that wouldn’t be a good reason for planting it. The grape of Cahors and, of course, Mendoza in Argentina. Performs better there, to be honest, but there are some Bordeaux growers, notably up in Blaye, that swear by it. The big leaves are the giveaway when it come to recognising the vines in situ. A popular grape in Chile and permitted in Bordeaux. Off the top of my head I can think of some châteaux like Clerc Milon and Brane Cantenac that have some, but it’s a minor player. Véraison a little after the Merlot, which it resembles. 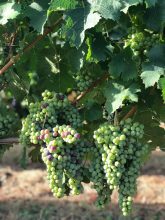 Fruit-set – the formation of even bunches – can be a problem. These are not permitted for use in Bordeaux wines and we planted them for, um, experimental reasons. If there’s a serious side to our endeavour, it’s the impact of global warming and how different varieties might work. We’d also like to offer our customers something different if the wine could be more than passable. The red grape of the Northern Rhone, as in Hermitage, Côte Rotie, Crozes Hermitage and St-Joseph. Of all the varieties that are not permitted in Bordeaux, Syrah seems an interesting option. Indeed, our neighbours at Château Thieuley make a good Syrah under the Vin de France label from vines close by, though I haven’t tasted theirs for a few years now. 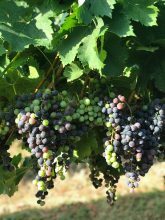 Véraison was not dissimilar to the timing of the Merlot, and it ripens well each year. And who doesn’t like Syrah? One to watch. The grape of the southern Rhône, Spain (Garnacha) and beyond. Makes many great wines and a lead component in, say, Châteauneuf-du-Pâpe. Our vineyard manager, Daniel, isn’t convinced for here as it seems more vulnerable to ‘les maladies‘ like mildew. Is it too damp here? Protracted vérasion during August. The jury’s out. It’s fair to say that véraison is less noticeable with the whites than the reds. We are unusual in that we have a lot of white – over 50%. Just 11% of the Bordeaux vineyard is planted with white varieties, with an even split between Sauvignon and Sémillon – 46% each or 92% of all white. Muscadelle makes up 5% of the white total but we don’t have any. Many of the more famous white wines of Bordeaux are sweet, like Château d’Yquem, though in production terms, about seven times more dry white is produced than sweet white. Yields for sweet white are much lower. The extremely popular variety among consumers, even if many in the wine trade are a bit sniffy about it. I love Sauvignon Blanc, although as a grower it is vulnerable to a horrid wood disease called Esca. (Don’t worry, Esca doesn’t affect the taste – but it kills the vine.) Quite different to Sémillon, its fellow Bordeaux variety, even with the appearance of the bunches. The grapes look like they’re really packed in to each bunch, all fit to burst. It’s also the one grape where the taste of the grapes closely resembles the wine, though that’s only my opinion. We are higher up than many Bordeaux vineyards and that suits the variety here. Sauvignon Gris is much less common than Sauvignon Blanc but is popular with some growers. More pink than ‘gris’ (literally, ‘grey’) and the juice is clear. The Sauvignon Gris vines are in a different corner of our vineyard to the block with the other varieties shown here. The underrated Bordeaux variety and I often have to remind people that there are great dry whites like La Mission Haut-Brion which have a high percentage of Sémillon, and the great sweet whites of Sauternes and Barsac are, of course, made primarily with Sémillon. We also make our Crémant de Bordeaux using Sémillon. Then I have to wake them up. The opposite of Sauvignon – popular with the wine trade, less so with consumers. I love both, to be fair, and the Riesling here seems to work well. No doubt a better informed visitor from Alsace or Germany will put me straight – too ripe here? – but I’m tempted. I doubt Chardonnay needs an introduction. Performs well here, and our neighbours at Château Thieuley make a decent Chardonnay as a Vin de France, as well as the Syrah above. Whether it would make great wine, as in Burgundy, is a different matter. The grape of the Loire – in parts – and South Africa. Again, I’m a fan of Chenin Blanc and it seems to grow well. The wonderful grape of Condrieu in the northern Rhône. Rose tinted specs perhaps but I need to be persuaded not to give it a try – or the other way round, depending on the mood. We’ll be tasting and testing during the harvest. If we go for planting any of the non-permitted varieties in volume, and de-classify some parcels to Vins de France, the bank manager will no doubt call in the people with the white coats.